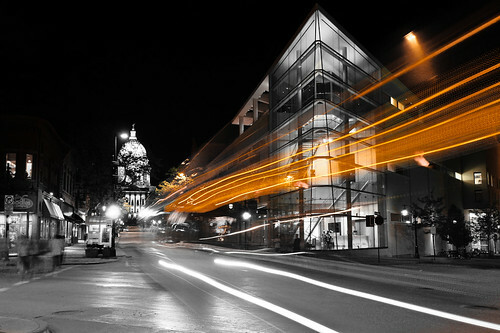 This entry was posted in Photos and tagged "Dane County", "Madison, 2011, architecture, b&w, black and white, bus, canon EF 17-40mm f/4L USM, canon EOS 5D, capital, capitol, city, cityscape, downtown, headlights, image, intersection, isthmus, johnson street, lights, long exposure, loren zemlicka, madison metro, may, Midwest, night, nighttime, north america, Orange, overture center, photo, photography, picture, selective color, state street, streaks, street, tail lights, traffic, trails, urban, usa, Wisconsin by lorenzemlicka. Bookmark the permalink. Very interesting picture, I love it!